This is an ongoing glossary of grains, both gluten-containing and gluten-free, in English and Hindi. Every cuisine has a staple source of carbohydrate. Today, the most commonly used grains are wheat and rice in different forms. In North Indian cuisine Indian breads made with wheat are staple, while in South India, rice is the staple grain with curries and other dishes. Rice and wheat are popular in other cuisines too. For example, in South-East Asian cuisine rice is the staple gain, in North African cuisine couscous made with wheat is a staple, in Italy and many European countries much of pasta and pizza is made with wheat or rice and in Continental cuisine loaves of bread are usually made of wheat flour. Different types of millets – the traditional grain! Wheat and rice may be amongst the most popular grains, but millets (such as pearl millet (bajra), foxtail millet (kangni), sorghum (jowar), finger millet (ragi), etc), are amongst the healthiest of grains available today. Whole millets and millet flours are naturally gluten-free and a great alternative to rice and wheat in most recipes. With gluten sensitivity being on the rise, awareness about different types of millets as a healthier alternative increasing. 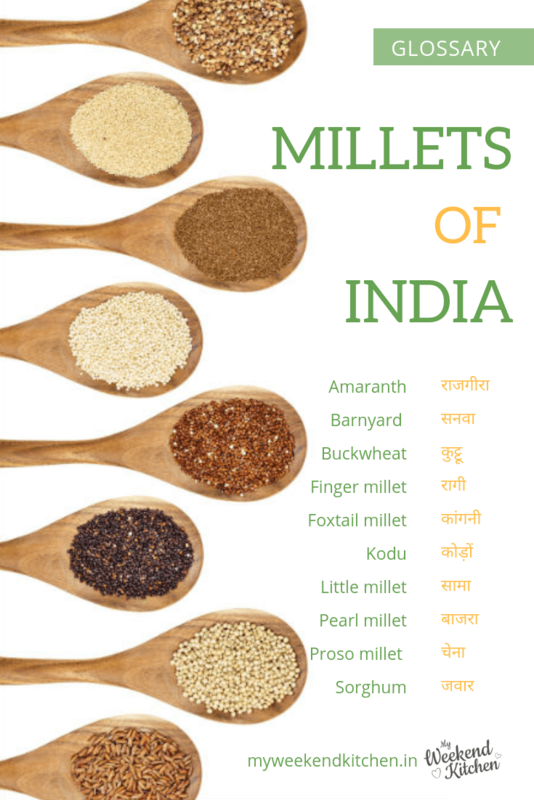 Since millets are known by their local names in most regions, I wanted to create a list of different types of millets in at least Hindi and English for reference. The most popular Indian millet is Pearl millet called Bajra in Hindi and the second most widely grown millet in India is foxtail millet, called Kangni or Kakum in Hindi. Other popular millets are Sorghum, called Jowar and Finger millet called Ragi or Nachni in Hindi. Hope you find this list helpful. This is an ongoing list and suggestions for changes and additions are always welcome! Couscous No exact hindi word but it is like thick sooji. Do you have a healthy millet recipe to share? I would love to learn and know more! You can share your recipe link in the comments or connect with me on Facebook, Twitter, Google+ or Pinterest. Or join our newest journey into Recipe Videos.